I know how anxious it will feel, when you are thinking about making a change, in your personal or professional life. How do you know if it’s really right for you? Been there!! Working with the right coach is really important. I work with clients who are finding it challenging to refine their goals, and are committed to doing something about it. I am offering you a complimentary Get Acquainted call. 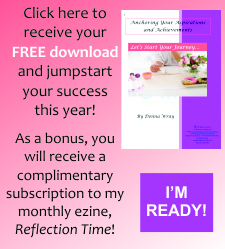 It’s a 30 minute chance for you to find out how I can help you refine your personal and or professional goals. If you are interested in finding out how we might work together. Click below to send an email to schedule a Get Acquainted call with me. If you have any questions, please email me at info@dwrayconsulting.com. I’m looking forward to talking with you!